The charismatic willow has a well-established presence in our minds, and not surprisingly, it has all sorts of cultural roles and traditional applications. Poets and writers are continuously captivated. 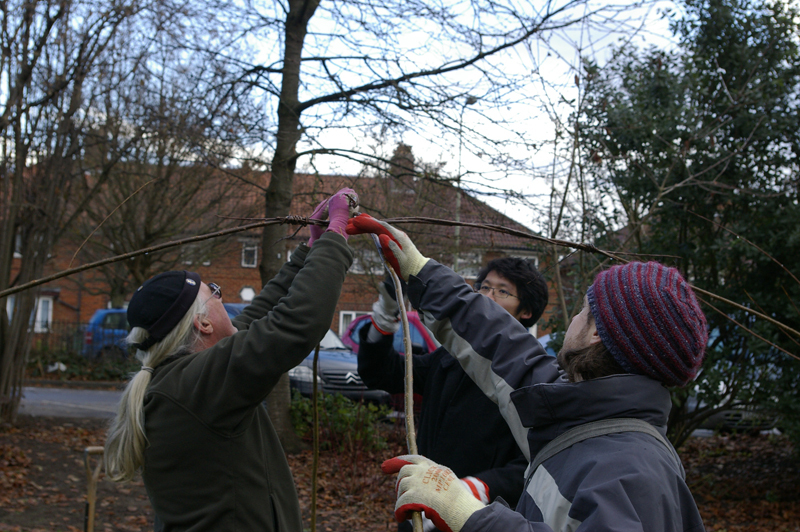 It’s even possible the tree once stood at the very centre of spiritual folklore in this country when pagan belief said that a willow gave birth to the Earth and the Sun. 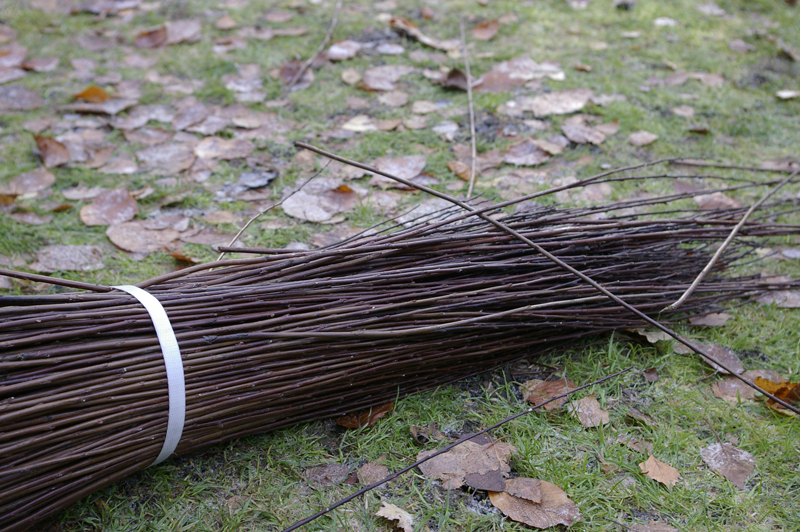 Willow has long been used for furniture and the like, its characteristic flexibility making it ideal for weaving among other things. Being a native tree here in Britain and remarkably fast growing, it is an obvious consideration for sustainable building, although it’s size tends to limit the application. 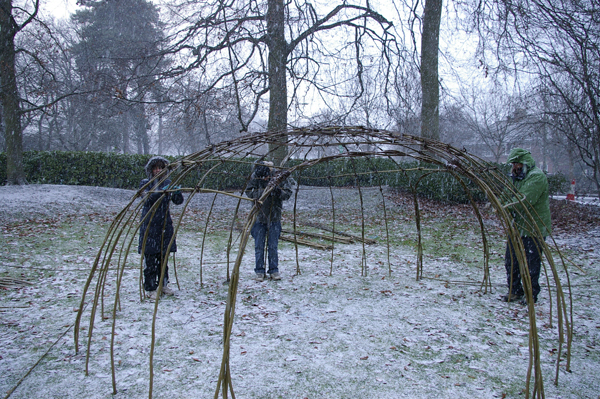 One way to utilise willow is through ‘Living Willow Construction’, the ‘living’ element of which will quickly become clear as I talk through the process in the context of building a dome. 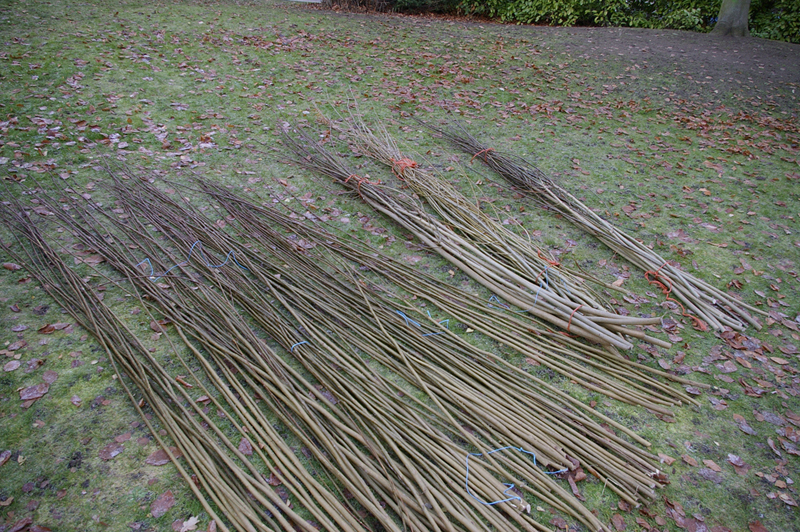 The willow we used is a hybrid variety that is coppiced every year, right down to a stump, providing these lengths. The smaller rods are a slower growing variety that have been dried and steamed and are used to lash the lengths together. One of the beautiful things about these structures is that these two elements are all that make up the construction. Four extremes of a rough circle are marked at a distance that allows two opposing rods, at the desired curvature, to overlap enough to be lashed together at the centre. 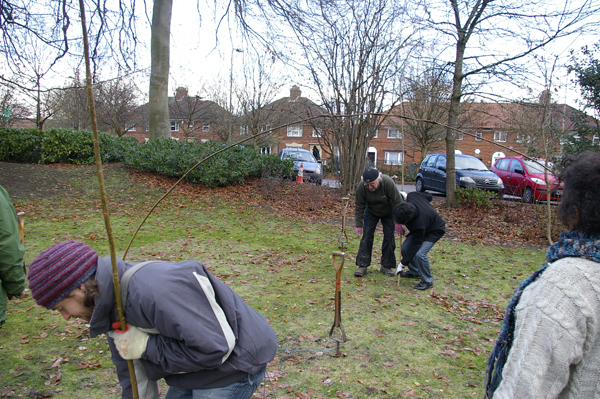 The first four rods go into the ground, about 10 inches deep (which in this case we pre-bored with stakes). 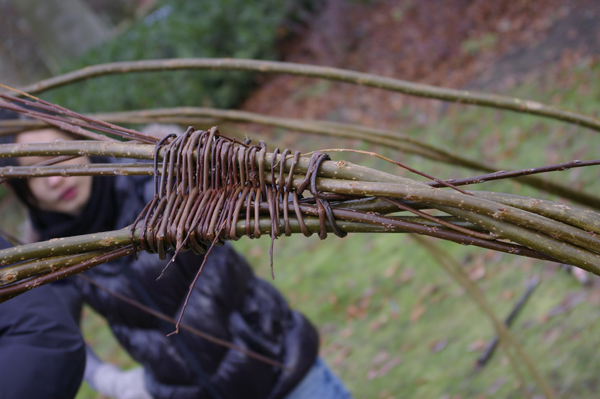 Each pair of opposing rods creates an arch, these are then lashed together at the centre point. 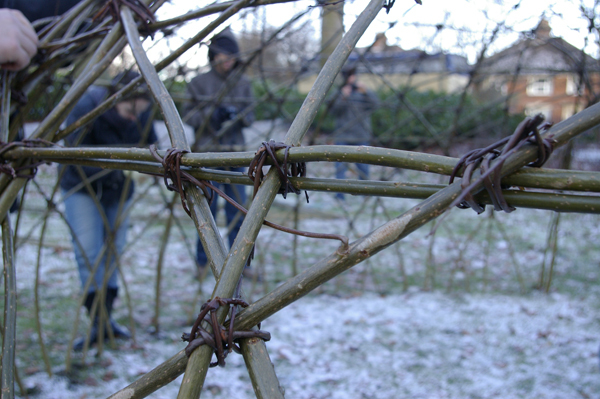 In the spring the rods will put down new roots and hopefully start sprouting new growth, which will cover the dome. 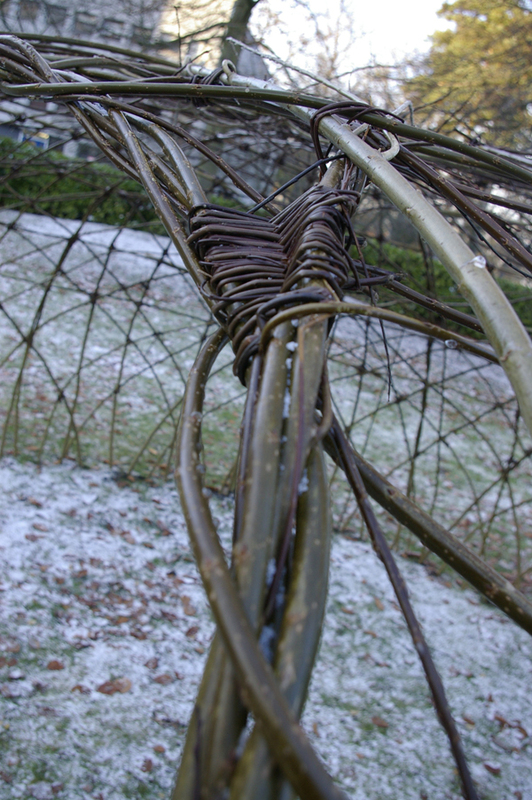 Some of the thinner rods are used to create a kind of halo, reinforcing the structure. The circumference of the dome is then split into eighths with a new rod going into the ground between each of the original ones. 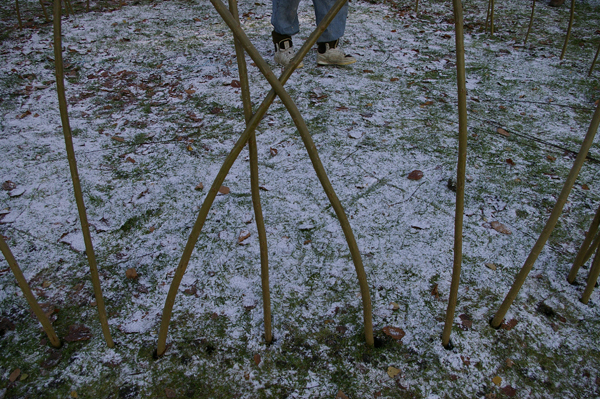 Each upright is then given a partner that is inserted right next to it and wound in up to the centre. In these and other places the rods will eventually merge together in pressure grafts. At this early stage it is decided where any entrances will be placed and a third rod goes in at the either side of the proposed entrance but instead of following the others up to the centre they curve in towards each other and interlock, creating the outlined of an arched doorway. The lashing is just done intuitively, in whichever way feels appropriate, generally criss-crossing and tucking away the end to avoid it unravelling works well. In the case of two rods running roughly parallel, such as where the entrance is established, a figure of eight technique can be employed. 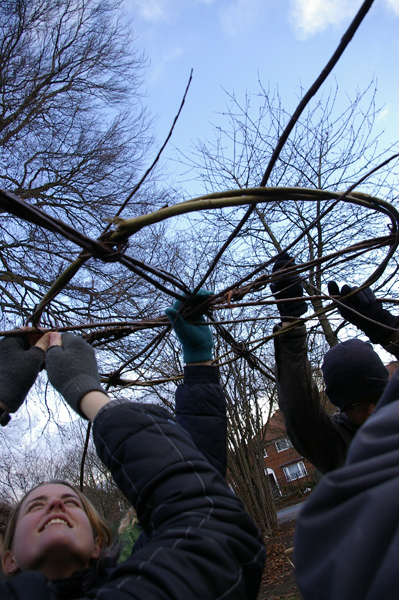 More rings are added as the dome is further dissected into smaller segments. Once the interval between uprights is down to around a foot, two holes are staked in each gap. 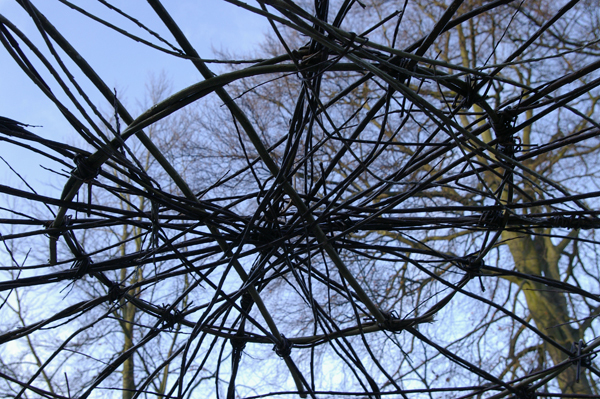 Rods are then woven diagonally up into the dome and lashed at several points where they meet other pieces. All that then remains is to wait for the new growth, continuously weave it in and maintain the shape with a hard autumn prune. 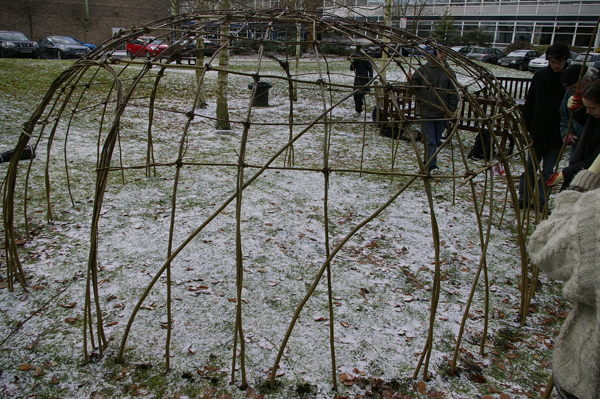 Living Willow Domes are blissfully simple to create and working with the single material and no tools (with the exception of something to sink holes) is remarkably satisfying. I do find myself wondering how this could be developed into a slightly more substantial building method and it will be interesting to see how successful a rain screen it is when fully covered. 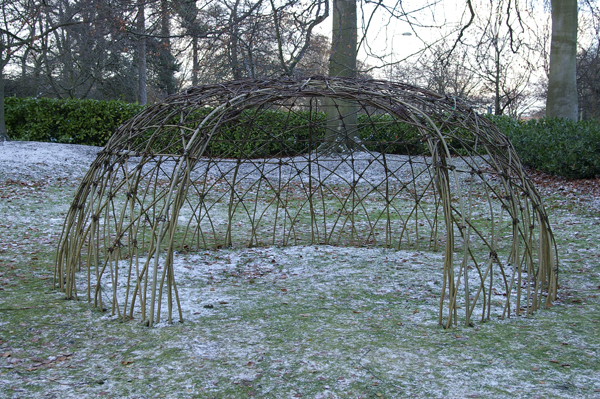 I wonder if it could be insulated somehow, maybe in combination with some daub, willow is often used in place of wattle. We’ll see. It’s a fantastically versatile material to experiment with anyway. 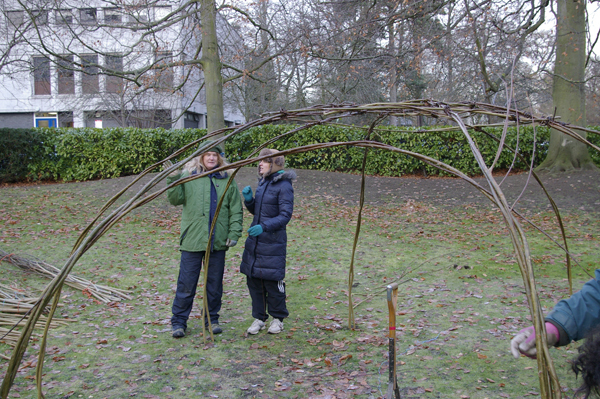 We (The Oxford Architecture Society or ‘OxArch’) made our dome with the help of experts Steve and Simone from Willowpool Designs who provided the willow and the know-how. 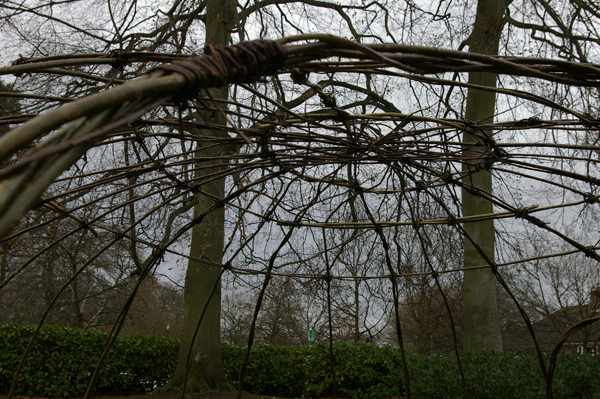 I just love living willow constructions, and the domes are so asthaetically pleasing, beautiful. Have you had a go at making them yourself? I would love to, wouldn’t it be wonderful to have something so blissfully simple yet so beautiful in your garden? Thanks for the comment SR. They are rather wonderful. I particularly like the lashing, again I think it’s the simplicity. This is the first one I’ve made but I’m confident I can do more. I’m no expert of course but it’s one of those things where once you understand the method you can just go for it, and vary the form too. In your case I’d go so far as to say you could make one off the back of this blog post, what’s the worst that could happen?